As you’ll see in the nutrition info, this recipe shared between two people is a meal on it’s own, but I wanted some extra protein. That’s why you see a slab of sous vide pork behind it. Place the fennel in a casserole pan, drizzle with oil and sprinkle with salt. Toss to coat evenly and place in oven for forty minutes, turning fennel once. 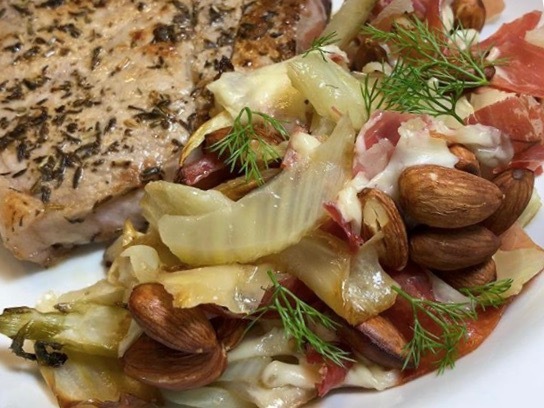 Top the fennel with the prosciutto, cheese and almonds. Return to the oven until the cheese is fully melted. Serve immediately topped with the fennel fronds.